After our trip to the states, and looking at the dominance of pour over and filter through the visit, we thought we should consider looking at is as an option. We ordered our Queen Thermo M, and below is a review. We rinsed the Thermopot, and loaded 1 litre of water to get the first run done. Added 48g of coffee, this we calculated using the 8g to 180ml SCAA guidelines, it worked out to 5.55 cups so we rounded it up, side note:This ended up being about 1/2 a European cup measure. As advised we wet the filter paper. Ground the coffee to filter paper standard, namely slightly course. Added ground coffee in to the filter basket. Switched on, and about 90 seconds later, the coffee was ready. The coffee was a good strength and a classic filter type taste. So we made a full pot. This time the coffee was a little on the weak side, so I would probably look at reducing to 2litres or add more coffee. Four hours later we tasted again, the coffee was still hot, and tasted good. I would definitely consider this as an option, we will look to offer this soon. 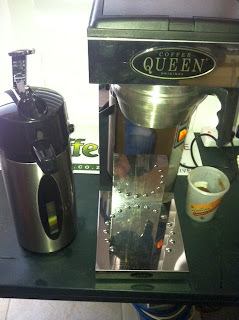 The cost of the machine is about R3,000.00 including thermo pot, and I think it should suit most peoples tastes. This test was done with fresh ground coffee. We repeated the test 2 days later with coffee ground 2 days before and the coffee was about 20-25% of the flavour. So if you want to use a solution like this you need to grind the coffee fresh.